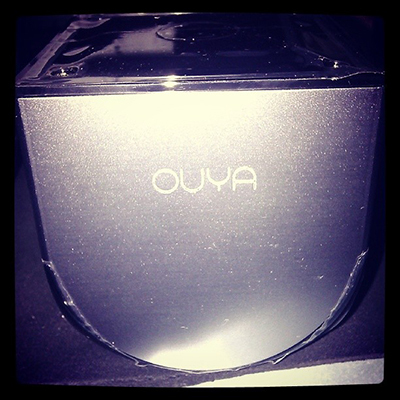 Recently, I had purchased an Ouya, the microconsole that was born from Kickstarter and has drawn both enthusiasm and criticism. On my end, it has had its good and bad points, but I do declare that it was well worth the money spent. It’s the kind of tech that gets better as it’s tinkered with more. I’ve been fiddling with it quite a bit, and it’s working well as both an all-in-one retro gaming system and an online set top box. Its size makes it very convenient as well. Note: I apologize for the quality of the screenshots. My capture card is acting up again, so I had to take them with my cellphone camera. I purchased this thing from DataBlitz Greenhills for PhP 5,150 since I paid with cash. At first, it was sold for 6.5k, then it went down to just below 6k, then it got as low as 5k, so I guess it was the right time for me to buy it. After getting it and a copy of Gran Turismo 5 for my PS3, I had trouble getting home due to heavy rain and traffic. It was a fairly tiring day, but nothing I couldn’t handle, although I clutched that plastic bag full of my purchases quite tightly in fear of them getting wet. I then dropped by PCHub in Gilmore the next day to buy a 16GB SanDisk Cruzer Fit to serve as external storage for the Ouya, which works quite nicely. It’s now where I store most ROMs and other downloaded apps and games. The main premise for the Ouya is that games can be played for free in a limited time, then they can either be bought or buried. There are some interesting titles in its library, including MirrorMoon EP and Sine Mora, both of which I have played on the PC. So far, I’ve tried Fist of Awesome, Hero of Many, Sonic 4 Episode I, and so on. It does seem like I won’t be able to play touchscreen games, so I sadly can’t play Rymdkapsel here. 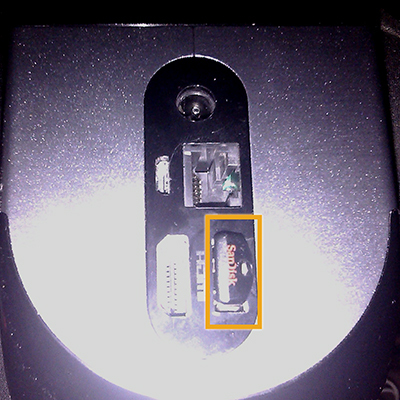 One of the reasons why I bought this was for emulators. It really feels different playing all those classic games on a TV compared to playing on the PC, and I prefer the former. The Ouya can emulate from the old stuff up to the PlayStation, and good emulators are available on the Ouya store mostly for free. 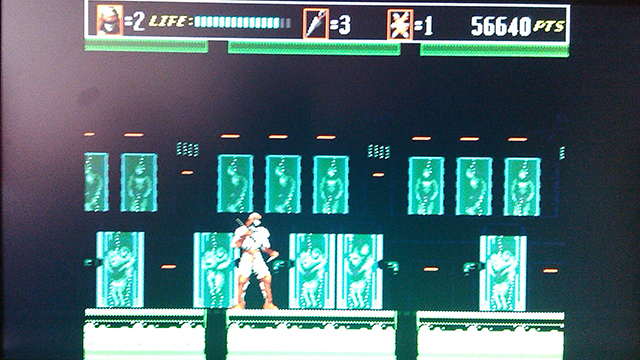 I just loaded stuff up, and I was soon playing my favorite Genesis game Shinobi III on a TV again, after a 15-year blank. Another reason why I wanted this was the prospect of using it for watching videos and livestreams. After rooting it and loading it up with Google Play and so on, I immediately looked for a DLNA player that will connect to my Seagate Central. 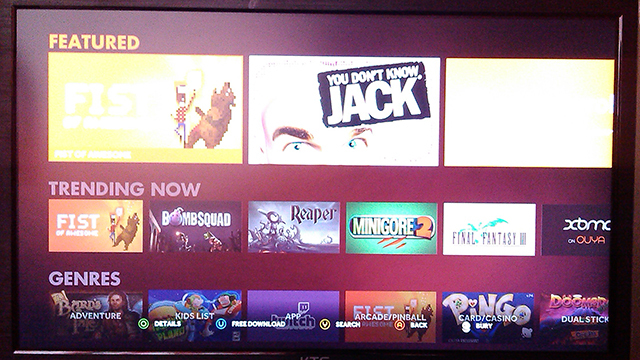 I then found UPnPlay, which worked brilliantly with MXPlayer due to its playlist features. Setting MXPlayer up with H/W encoding made for good HD viewing. Since I have my TV hooked up to an amplifier and speakers, it sounds pretty good too. 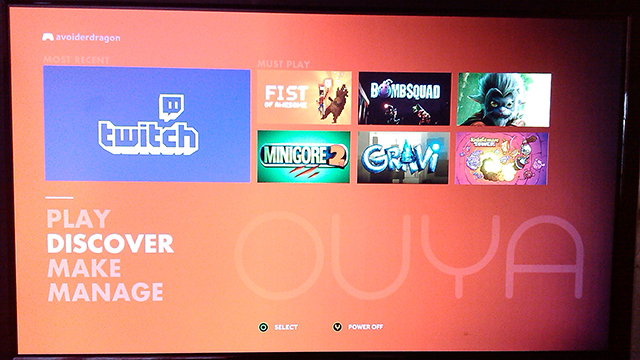 There is also the Twitch app on the Ouya store, and it works very well. 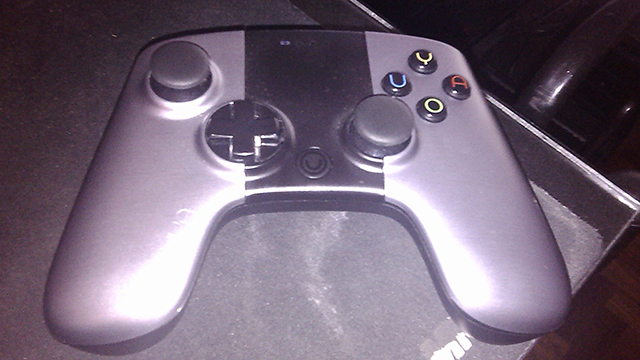 People have always complained how laggy Twitch could be, but it seems that they had taken care of those problems by the time I got my Ouya since I’ve not encountered many problems with it. 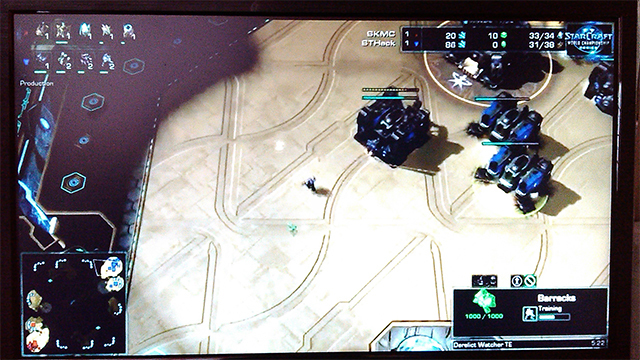 In fact, I had been watching the WCS 2013 Season 3 Global Finals for StarCraft II while writing this. As previously mentioned, the portability of this device is quite a benefit. It’s only 3 inches on all sides, so I am able to put this in my bag and bring it to other people’s houses and so on to play it with friends. As long as there’s a TV with HDMI, then I can just hook this up and have fun with friends quite easily. This advantage will definitely prove to be great once I start taking it to overnight sessions with friends. Buying games requires a credit card, which I’m very apprehensive of giving out due to security reasons. I’d use my PayPal gladly, but I’ll have to find a source of credits for Ouya somewhere. In the meantime, I may have to rely on other sources to get my games for this thing. 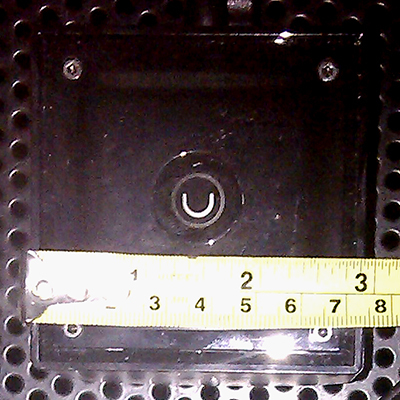 Until then, it’s a PhP 5,000 set top box with some gaming features at best. I’ll be finishing old games with this thing since I’m not very willing to play emulated games on the PC due to work and other reasons. The real fun with thing will be had once I start bringing this to people’s houses, so it’s still cool. Overall, it’s a pretty good purchase, although I’ll have to dig even deeper to find more use out of it. I might post other updates in the future when I do.